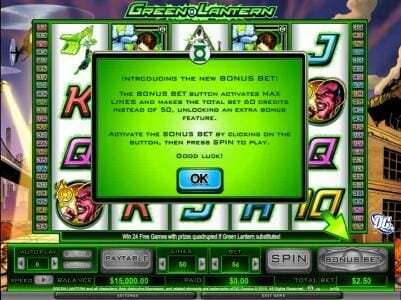 Green Lantern Slots 5 out of 5 based on 1 ratings. 1 user reviews. 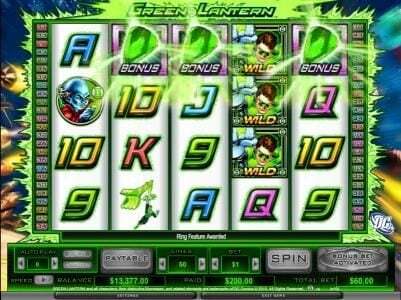 Green Lantern is a 5 reel, 50 payline Video Slot from software company CryptoLogic. This slot game includes multiple slot features to enhance its quality and your winning abilities. 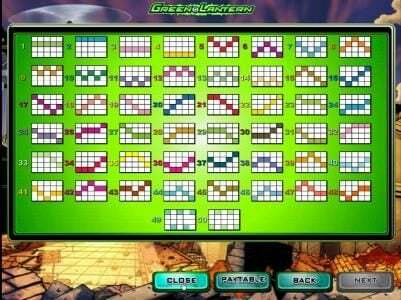 This includes such features as a scatter symbol, wild symbol, multipliers and free spins. 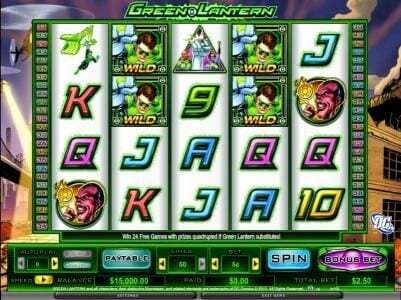 The Green Lantern takes it up a notch by offering a top payout of $400,000 which makes this a slot worthy of attention. The Green Lantern is based on DC Comics comic book hero. This was a popular cartoon book that was read by millions each month. It was also released as a movie recently and saw new fans of the series be created. The slot offers some outstanding images within it as you will see the George Washington Bridge in New York, helicopters and spotlights as well as destroyed buildings in ruins. The graphics are neon green which is exactly as they should be considering the theme of The Green Lantern. There are some beloved characters symbols that will appear on the reels. The first is the nine, ten, jack, queen, king and ace. All of these are standard slot fillers and all add to the potential for wins. There is also the Green Lantern, two ring symbols, one that represents the scatter and the other a bonus game, there is Ganthet, Sinestro, a triangle symbol and a more. All are done well and give you a classic comic book feel to them, both in design and colors that have been used to emulate them. You can bet between $0.01 and $20 per line with a max bet being $1000 per spin, making this a high roller favourite. An additional wager can be made using the bonus bet, which adds 10 additional lines to this slot and increasing the maximum wager to $1200. The Wild symbol will only appear on the second and fourth reel. It will also double all wins that it completes with the exception of the scatter ring symbol. If the battery symbol appears on reel three with the wilds on reels 2 and 4 then the free spins will be triggered. You will win 24 free spins and all wilds that appear during those Free Spins will apply a four times multiplier to any winning combinations. 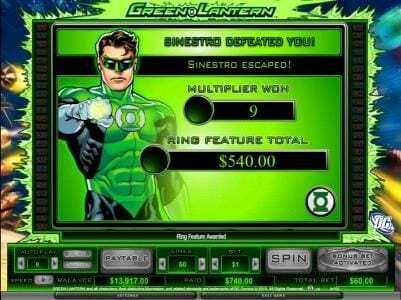 The bonus game in The Green Lantern, referred to as the Ring Bonus, is awarded when three of the scatters appear. This will see the Green Lantern and Sinestro go to battle while the reels remain frozen in pace. You can win up to 100 times your triggering bet in the Bonus game depending on the length of the power beam. This is a fun game that brings back fond memories of reading the Green Lantern comic book and recalling the excitement that was felt getting a new edition and diving into the fantasy world it offered. Green Lantern based from the famous comic book. 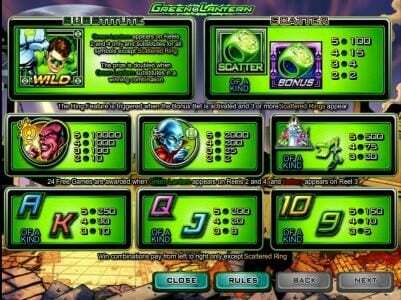 You can change your speed in this slot game from slow/medium to fast to superfast. There is a crazy feature where you get to battle the evil guy. For the life of me I still have not figured out to play this feature. I just click like crazy and hope something will happen. It never does. This one can pay quite nicely during free spins. A definite one to master.